The Religious Congregations of the Diocese of Westminster gathered at Westminster Cathedral on Saturday 1 February for a Solemn Mass in celebration of the gift of Consecrated Life. 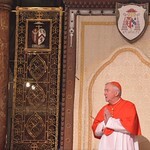 Mass was celebrated by Cardinal-designate Vincent Nichols, Archbishop of Westminster. Representatives from most of the 98 female religious communities in the diocese attended. Among them were 24 who were celebrating their 25th, 40th, 50th and 60th jubilee anniversaries. The Mass followed the news on 31 January that Pope Francis had announced that 2015 will be the Year of Consecrated Life. Find out more here.